This is a great opportunity to buy a property perfect for condos or a hotel on the front range in Ojochal with amazing access and amazing ocean views. The property looks down on the Terraba River mouth where the ocean and waves are constantly changing, one of the best views you can get. 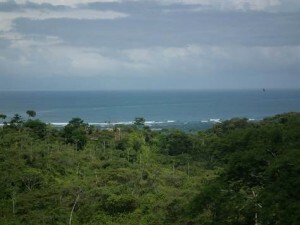 It is only a few minutes into the center of Ojochal and a few minutes to the highway and the closest beaches. There is plenty of room to build multiple units or a hotel and you just don’t find that in this location. There is also an existing home on the property. It is a 3 bedroom home but it is broken up into 3 seperate 1 bedroom units. Downstairs there is a 1 bedroom home with living room, bathroom, office nook, and full kitchen. The downstairs opens up to the pool deck. Upstairs there are 2 seperate studio apartments each with it’s own kitchenette out on the covered balcony. You can live downstairs and make a nice retirement income and run it as a BnB while you develop the rest of the property.